CON-TROL-CURE Power Supplies are sold either encased (complete) or unencased. The encased power supply includes all wiring to ballast, control and high voltage DIN Rails (see next page), capacitors, control panel switches, and display meters. It is ready for use upon delivery. The unencased unit contains the power supply and capacitors required for operating a specified UV lamp. No wires or other related components are included. It is an ideal solution for replacing or upgrading components within an aging system. Con-Trol-Cures Encased Premium Power Supplies include a variety of unique performance features custom designed to match your specific UV lamp specifications. Our exclusive Lamp Voltage Interface (LVI). Designed specifically to monitor the high voltage draw of UV lamps, the LVIs numeric display can be directly associated with the lamps' voltage consumption. This numeric data can be collected to establish statistical benchmarks and track the lamps performance. Once a baseline is established, lamps requiring replacement can be easily identified prior to causing any production issues. Thermal-safe overload switch shuts down system to protect against overheating. Housing fan runs automatically and will shut down once the housing is sufficiently cool. Control features include: on/off switch, ammeter, hour meter, and indicator lights. Available in 300, 400, 600, and 750 WPI capacities. Basic Encased Power Supplies offer 3-level power switching. Premium Encased Power Supplies offer 8-level power switching. Dual Encased: Power 2 lighthouse irradiators from 1 unit. Pre-Wired Unencased: All the components offered in our Basic Encased system, wired together and mounted to a backplate. Allows easy incorporation into your equipment housing. Ideal for applications requiring 4 or more power supplies that require you to construct a centralized control box housing. Unencased Ballast: Power supply and capacitors required for operating a specified UV lamp. No wires or other related components offered. 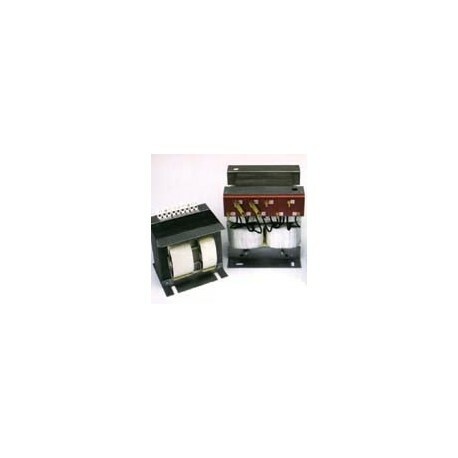 Ideal for replacing or upgrading components within an aging system. To integrate unencased ballasts into a 3rd party production system, the end user must provide all necessary mercury relays and appropriate wiring. UV Process Supply can provide recommendations and pricing for related components such as timers, metal housings, and volt interface units. Replacement ballasts and related components are also available for existing systems. To ensure that you receive the correct parts for your system, please specify wattage, part number, and quantity required. Individual replacement parts for unencased systems, such as capacitors, relays, and wiring, are also available. We can provide customized ballasts to meet your specifications. Important Note: UV Process Supply does not provide engineering support or technical service for installation. While our ballasts are suitable for emergency power reduction switching, and can be interfaced with temperature sensing devices, etc., the customer must provide all electrical engineering and installation expertise. ie: For an encased 400W/Inch power supply, the part number would be A032-4##. ie: For an unencased 300W/Inch power supply, 8" arc length, the part number would be A031-308. ie: For the above item, A031-308, if a Premium Power Supply, the part number would be A031-308P. Pre-wired, 2-position mounting bracket incorporates all switching relays (including mercury), timer, fuses and grounding. Color-coded and numerically-coded with diagrams for quick, error-free installation. Pre-wired, 2-position mounting bracket includes high/low/medium volt interface (up to 2000W) and grounding on 2-position mounting bracket. Color-coded and numerically-coded with diagrams for quick, error-free installation.